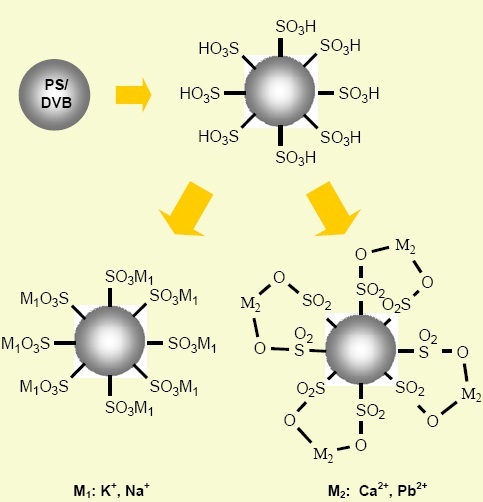 Carbomix phases are composed of spherical, low cross-linking polystyrene/divinylbenzene (PS/DVB) particles with their surfaces modified with sulfonic acid (-SO3H), followed by chelating of metal ions of calcium (Ca2+), lead (Pb2+), sodium (Na+) or potassium (K+) to form Carbomix Ca-NP, Pb-NP, Na-NP, K-NP phases, respectively. The PS/DVB support has cross-linking degree of 5%, 8% and 10% with the particle sizes of 5 and 10 µm. The uniform particle size adds the benefit of high separation efficiency to Carbomix. Carbomix resins have been specifically designed for high resolution separation of carbohydrates, organic acids, peptides, and nucleic acids. Carbomix resins can be packed into wide range of column dimensions with ID from 75 mm to 21.2 mm and the length from 5 cm to 30 cm. A custom-made column is also available. 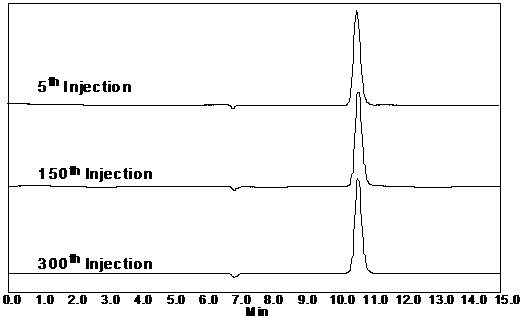 Column length and diameter affect resolution and analysis time. The selection of the column is to use only as much resin as necessary to achieve the desired separation. If the compound is strongly retained by the resin and analysis time is long on a 300 × 7.8 mm column, a shorter column, such as 150 mm long can significantly decrease the analysis time. 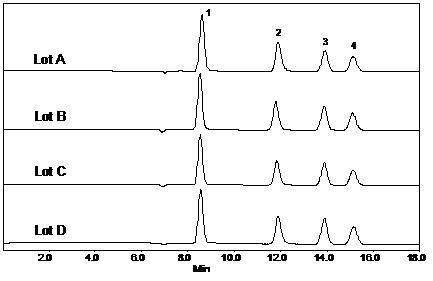 The separation mechanism for the Carbomix Ca-NP phases includes ion-exchange and hydrophilic interactions with the analytes, such as carbohydrates and organic acids. The separation mechanism could also be due to size exclusion, ion exclusion, and ligand exchange. These multiple modes of interaction enable a unique capability to separate a variety of water soluble compounds. Resin cross-linking degree is an important parameter in the separation. Styrene divinylbenzene resin is a relatively rigid gel-type media. The lower the cross-linking, the more open the pore structure, and the more permeable it is to higher molecular weight substances. A 5% crosslinked Carbomix resin can resolve higher oligosaccharides compared to 10% cross-linked resin. For smaller molecular weight compounds an 8% crosslinked resin is used. The Carbomix resins are stable in pure water and other aqueous buffers at elevated temperature. The reproducibility from run to run is very consistent. 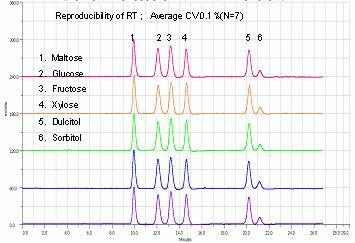 Figure below shows the retention time variation for 7 runs is only 0.1% for a Carbomix Ca-NP5 column. With well controlled polymer resin production and the surface chemistry, the manufacturing of the Carbomix ion-exchangers is highly reproducible. The typical variation of the retention time is less than 6% from batch to batch. 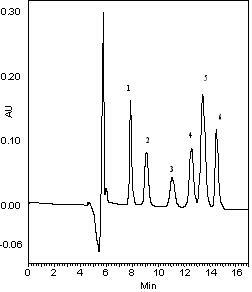 Figure below shows the reproducible injections at 5th, 150th and 300th run with 10µl galactitol on a Carbomix H-NP10 7.8×300 mm column. The Carbomix resins and columns offer many advantages for the analysis of carbohydrates, alcohols, and organic acids in food, beverage, biochemical, biomedical, and biotechnology applications. Organic acid and alcohol analysis include sugars with organic acids, alcohol, glycol, and fermentation products. Carbohydrate analysis includes samples of beet sugars, molasses, corn syrup, pentose sugars, cellulose hydrolysates, oligosaccharides, glucose, galactose, sucrose, and fructose. One-piece PEEK coupler, recommended to connect columns in series.